« Finish! Finish! And Finish! It isn’t Christmas really, not for another 3 weeks, but this is the point when I start to feel Christmassy. The feeling will evaporate completely by the time I’ve worked my way through a couple more weeks, but for now I’m enjoying it. We have started our advent calendar (and one full of doggy treats for Muffin), people are putting up decorations, the Sky TV guide has that annoying jingly xmas music in the background and there has been xmas knitting. It’s a tree decoration, just a few inches high, and the Father Christmas poking his head over the top is made of chocolate. These are more decorations, for Rachel at work and her husband and son. 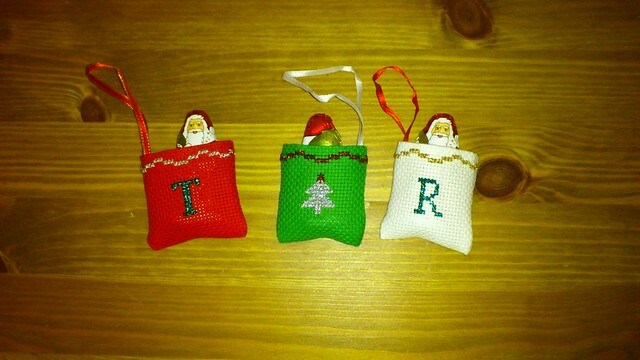 Each one has an initial on one side and a tree on the other and is occupied by a chocolate Father Christmas. He’s really getting around at the moment! 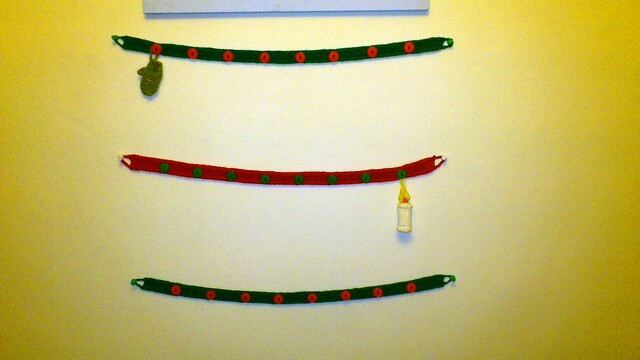 This is the Advent Garland by Frankie Brown, available for free from Ravelry. The decoration patterns are being released one-a-day throughout advent, so every day I get to knit a decoration and hang it on the garland. It is really fun, but also could get challenging. So far we have a mitten and a candle…I haven’t yet looked at today’s pattern, but it is really exciting. In other news, work has been really busy, lots going on. Last weekend we visited Alan and Kat for dinner, which was lovely. Sunday turned into a lazy day, with pyjama-wearing and television-watching and reading all morning. It was good to relax. This weekend we have Gethin overnight, which will be challenging but fun, as always. 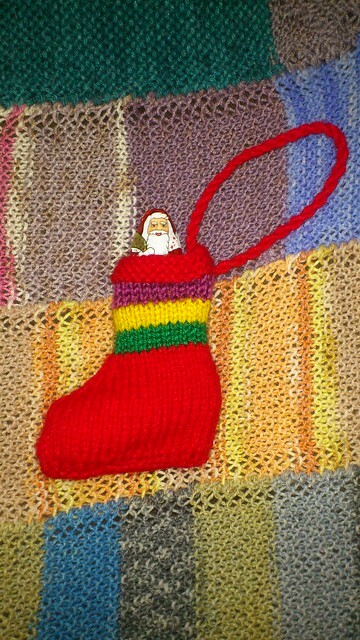 In the coming week, work work work, plus frantic knitting of advent decorations. This entry was posted on December 3, 2011 at 10:51 am and is filed under Cross-Stitch, knitting. You can follow any responses to this entry through the RSS 2.0 feed. You can leave a response, or trackback from your own site.